Membership is open to makers working in any craft who have achieved the expected high standards and who meet all the criteria. The Society is keen to attract members whose work shows imaginative spark and that engages with contemporary practice and aesthetics. Technical skill and understanding is a basic requirement for selection but applicants must also demonstrate a willingness to challenge themselves in the use of design, materials and techniques. The Society is particularly keen to attract new and innovative work and would welcome submissions from people working in unusual or unconventional materials. As a general rule, fine art, reproduction work, scale models, and photography, however well crafted, are not accepted. Students are not eligible. To be eligible for craft membership an applicant shall be permanently resident or working in Suffolk, or on its borders. The Committee may waive this condition if it considers that the applicant has had a long-term connection with Suffolk or the Society. 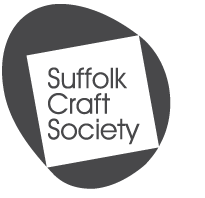 If a Craft Member subsequently leaves Suffolk they may remain a member of the Society. The Membership is divided into two categories. These are makers in continuing practice who pay a full subscription entitling them to all the Society’s services. (There is a probationary period of one year for new members overseen by the committee). The Society offers honorary membership to members who give or have given notable support to the Society or to crafts nationally, or who are outstanding craftworkers.